Underground Wellness – By far my #1 pick… I love everything I’ve listened to and there are years worth in the archive. 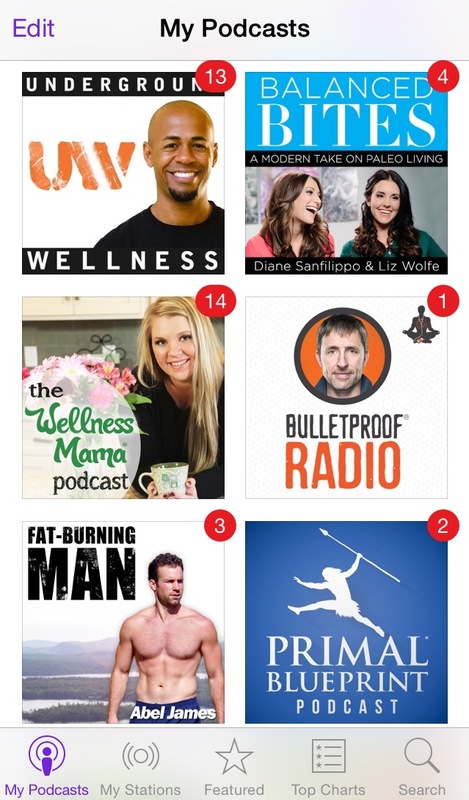 It’s hard to pick, but here are a few of my favorite episodes: Deep Nutrition with Dr. Cate Shanahan, MORE Deep Nutrition, The Coconut Oil Miracle with Bruce Fife, Heal Thy Mouth with Will Revak of OraWellness, Genetically Modified Foods with Jeffrey Smith, The Hormone Cure with Dr. Sara Gottfried, Gerald Roliz: Ex Pharma Sales Rep Tells All. H ealthy Mouth – Cavities, bleeding gums, root canals, bad breath… chances are that many of you don’t like going to the dentist. Gum disease, in particular, is a serious epidemic now – in 9 out of 10 adults – so, obviously the toothpaste & mouthwash out there isn’t doing a darn thing to help. The OraWellness brushing blend, made only with organic essential oils, completely transformed the health of my mouth (read more here). My gum bacterial infection is gone and I’ve healed two cavities – no fillings for me! I also use the toothbrush that they sell – specifically designed with less bristles to gently clean the tooth at the gum line. If you want to give the whole system a try, here’s the basic starter kit. 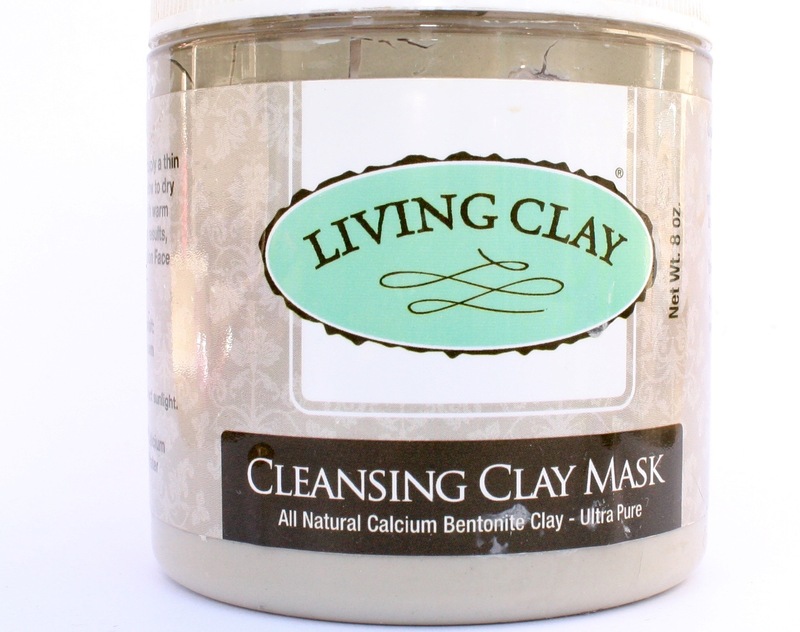 Living Clay – Used by some of the world’s finest spas, this Bentonite clay is not only beneficial for your skin, but has many other healing properties as well. It’s extremely absorptive properties help cleanse the body of toxins – I use it as a purifying face mask, any time I have a rash, as a detox bath, and even drink it in liquid form to cleanse my digestive system when I’m sick. For a comprehensive guide on the many ways to use it, I highly recommend this book – Living Clay: Nature’s Own Miracle Cure; you can also read some excerpts here. Activated Charcoal – Read my blog post on this amazing substance and how it can be used for teeth whitening, acne, food poisoning, digestive issues, bug bites & stings and even hangovers. Add the capsule or powder version to your first aid kit today. Coconut Oil – I’m begging you… please throw away those harmful vegetable/canola oils in your pantry and buy this next time you are at the grocery store. I have replaced all oils in baking and cooking with this – it has incredible healing properties and is really easy to use. And I use it to wash my face and moisturize my whole body; my skin has never been better. Read more about the miracles of coconut oil here. Natural Deodorants – Last October, with Breast Cancer Awareness Month in mind, I wrote all about some great natural deodorant options that are free of cancer-causing aluminium and parabens. I recently found another product I love – Primal Pit Paste. I find the best success in alternating deodorants every other day, so I also currently use Silver Shield Deodorant. Bonus: Both products are made locally and are also man-approved by my husband! 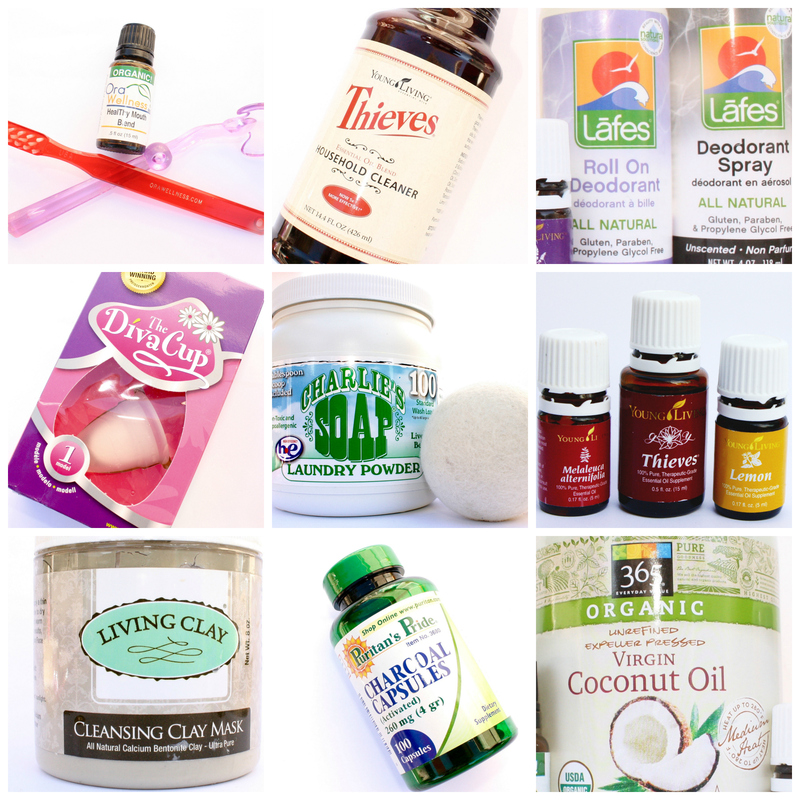 Essential Oils – I’m obsessed. Sometimes, I wonder what I ever did without them; then, I remember that I took medicine… and suffered for it. Instead of reaching for side-effect-causing pharmaceuticals, I can now use something safe and natural for my whole family (dog too!). Now’s the time to update your medicine cabinet! Diva Cup – For women only: that “time of the month” may be a strange topic to discuss, but you should seriously rethink the hormones and chemicals going into your body through the feminine hygiene products you use. Since the chemical glyphosate is used in growing cotton, you are exposing your body to this cancer-causing toxin every time you use a tampon. I am so thankful for this product; not only is it much safer for my body, but it’s also made a huge difference in the debilitating cramps I used to experience each month. 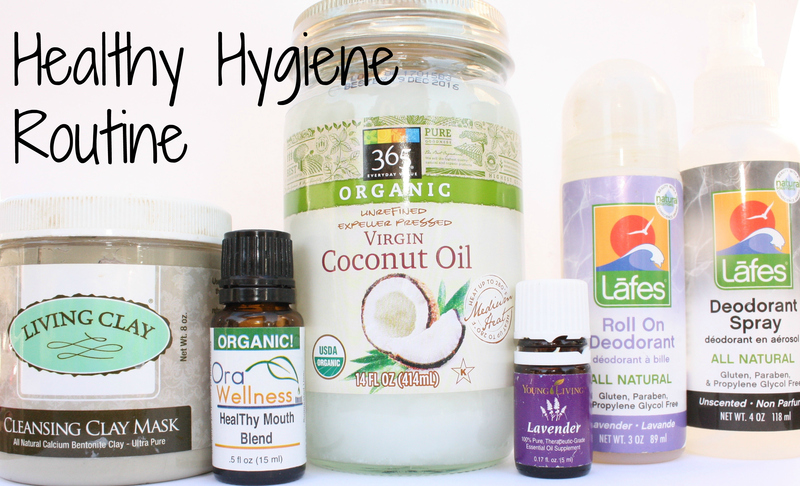 All-Purpose Cleaners – This is one of the few products I do actually make myself with lemon essential oil because it is just so easy. But, in the past, I have loved using each of these natural products: J.R. Watkins All Purpose Cleaner, Branch Basics, and Young Living Thieves Household Cleaner. Each of those have great hand soap options as well! Detergents – Most options you find in the stores have lots of chemicals, and with the items we clean being so close to our skin or even what we eat off of, the ingredients in these products do matter. I highly suggest visiting your local farmer’s market to find a local vendor who sells these as they often work the best, but Seventh Generation makes a couple of mostly natural items I use when I run out and need to buy at the store. The Laundry Detergent can be used in cold water & HE machines effectively and is free of fragrances & brighteners, as well as environmentally-friendly. The Dishwasher Gel works great too! 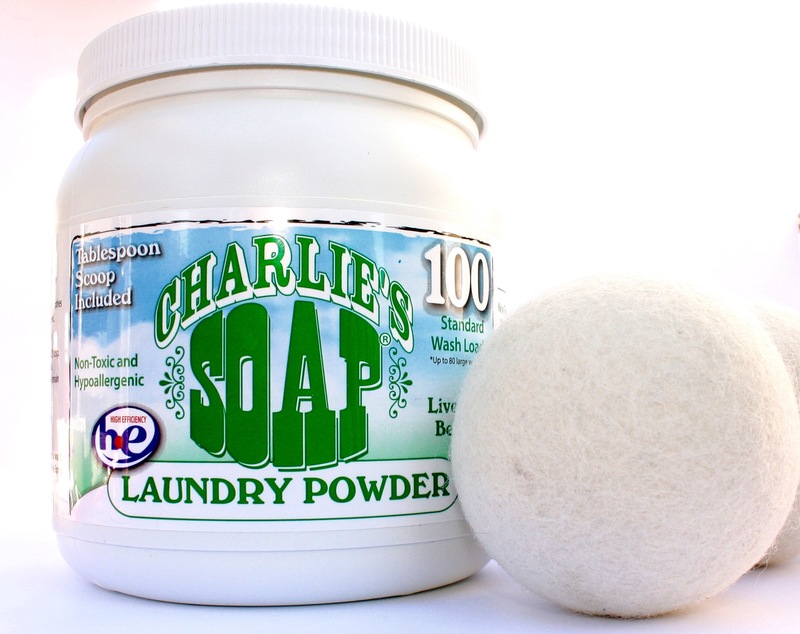 Wool Dryer Balls – Did you know that the chemicals in dyer sheets are terrible for the longevity of your clothes and your dryer, as well as bad for the environment? As soon as I learned there was an option that was not only safe in all those aspects, but also dried clothes faster and make clothes softer, I was totally on board. These are forever reusable and I can add a few drops of whatever essential oil aroma I’m feeling like. Buy the package of 6 and use them all at once for even better effectiveness. Do you have any other favorite, natural products to recommend? Will you be trying anything listed above? *A few of the links above are affiliate links, which means I make a very small commission if you decide to purchase that product. I appreciate the support to be able to keep this blog going.